What a wonderful memory to have, the beginning of a Hemingway-like story, gorgeous moments in time. It speaks of boredom, the need for adventure, to be lost and found. I’ve thought before that your time in Asia, although at the time not inspirational to you, is and will be a source of great riches. It’s not always the time in the limelight that give us the greatest material to ponder and elaborate on. 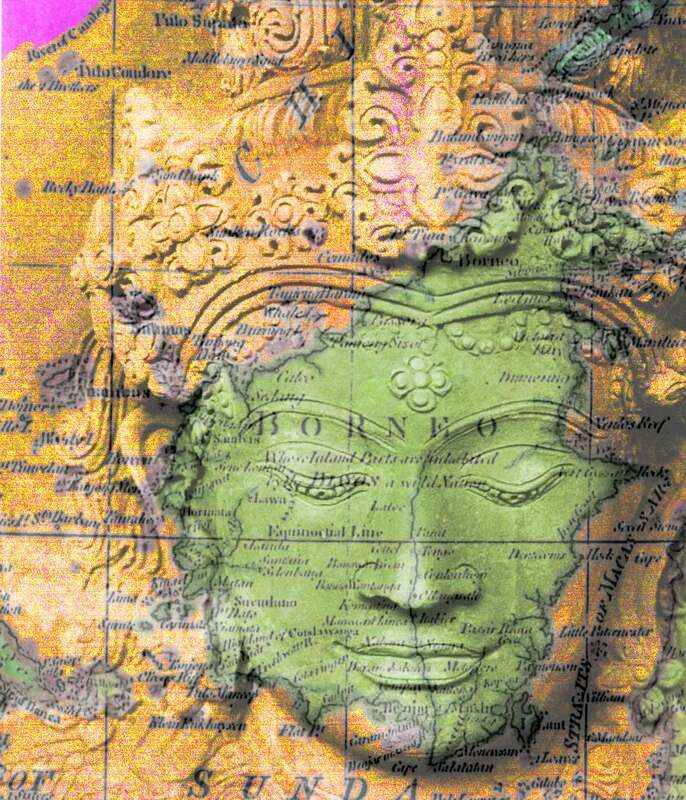 Love the artwork you posted as well, beautiful that superimposed mask on the map. Are you familiar with the work of Vietnamese American artist Din Q Lê? Thanks Judith, first time I’m showing this illustration I created back in Asia…on Thursday I suddenly had a story to go with it! The underlying face is a terracotta garden sculpture from Thailand (see more here) and an antique map of the region I handcolored. I wasn’t aware of the Vietnamese-American artist you mention, thanks for pointing him out. You’re probably right, my time in Asia was very trying but also great material and conditioning for the future. This year I had joined a full-day event reading sutras with a group of volunteers – we practice qi-gong, meditation, and study Tibetan Buddhism together. It was the first time since elementary school that I blindly read texts aloud for hours. How boring can it be? But that was immensely satisfying. Because it was a volunteering activity (I even took a day off from my work), I poured my heart and (hopefully) my soul into the mundane reading, and there I realized again that the real power of experience exists in what we bring to it, not what is given to us… No I didn’t have any enlightening moment, but it was nice to have that insight (and muscle ache and sore throat). Thanks for sharing Isao. I’d say that moment of insight counts as enlightenment! Chanting (or reading sutras) generates an energy field/vibration of its own, both in you and your environment….never thought I’d like it until I tried it. I agree with Judith, this is beautifully written and so evocative. A word snapshot of a moment of your life. I’m looking forward to many more of these. As for me, re: mindfulness. After my friend Wendy’s death I went into a horrible downward spiral, especially after testifying against the murderers. When it finally came time to start on a healing path, a book about Buddhism made its way into my hands and I started meditating twice a day. At the time I was attending the Commission on Human Rights in Geneva and if I hadn’t been meditating I don’t know how I would have dealt with all the human rights horrors and ghosts people brought in with them. I haven’t meditated in years, but the Buddhist idea of mindfulness has stuck with me in small daily actions. Like, being mindful not to rub my eyes or touch my mouth after being on a tram. Being mindful of the children I care for, being patient, being careful how I speak with them and to them if they are naughty. Being mindful of the people around me and spending time with people who make me a better person instead of those who drag me down. I’m not always successful being mindful, especially if I’m stressed out or travelling (oh man, how I detest travelling now! ), but I still do my best. Thank you for sharing this gorgeous post, and Happy Wesak Day.